Reading books and writing reviews is a passion, a hobby, but by profession I work in the theatre (and have for about thirty years) and so it should come as no surprise that I have a special affinity for books with a theatre theme. And as a member of the Children’s Book Writers and Illustrators Society, I also really enjoy a good book intended for younger audiences. I’m delighted to say that this works and appeals to me on all the various levels. This story is about high school sophomore Emma Allen. Her drama club is planning to put on a student production of William Shakespeare’s Hamlet and Emma will be the assistant stage manager. But if something could go wrong, it does, and it starts with the casting when the school’s best actor (actress) doesn’t get the leading role and Emma has a crush on the student director who doesn’t seem to know she’s alive. But when Emma falls through the stage trap door and finds herself in 1601 London and working for Shakespeare himself, the production takes on a whole new dimension. One of the aspects that most impressed me with this book is the authenticity author Molly Booth puts into the world of theatre. As a professional stage manager, I rarely comes across books that truly understand and capture what it is like to work in theatre – specifically stage management. But Booth writes as if she’s done this work, and not just for the local community theatre. Emma takes control, as she should, and learns a lot from the book-keeper with Shakespeare. She manages to grow as an individual and yet hang on to all the youthful energy and idealism of a teen. Booth really does a marvelous job. The Shakespeare-time portions of the book ring true and I suspect Booth did a fair amount of research to get this right. If not, it was written well enough that I was properly fooled. The only part that doesn’t ring true is the size and quality of a high school, student-directed production. I know that there are high schools that do some pretty massive productions, but I personally haven’t seen any. And a five-hour production? I would also disagree with what one of the characters says: “Shakespeare is easier to read than it is to speak, and it isn’t easy to read.” Most professionals would tell you that Shakespeare is much harder to read. He wasn’t intended to be read…he was intended to be seen/heard. I really enjoyed this book and would gladly read more from Molly Booth. Looking for a good book? 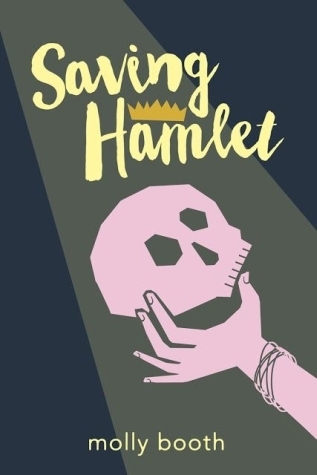 Saving Hamlet is a well-written YA book from Molly Booth and is worth reading if you are a fan of YA or good fiction with a theatre theme.